The TIP SA office will be closed from 25 Dec 2014 to 02 Feb 2015. DVA has developed an Introductory Information Pack to help Ex-Service Organisations provide information to people who may be interested in volunteering to provide pensions and welfare services . The Information Pack can be downloaded and printed locally so that it can be made readily available to people who may visit the ESO’s premises or for use in other promotional activities. CLIK is now available in an easier, simpler format. All DVA offices, including all Veterans’ Access Network (VAN) and Veterans and Veterans Families Counselling Service (VVCS) offices will close at close of business on Wednesday, 24 December 2014 and will reopen on Friday, 2 January 2015.
logging in to MyAccount through the DVA website to manage transport bookings and other services. hospital admissions – doctors can admit DVA patients into hospital and request admissions approval, where required, when DVA re-opens. urgent medical and/or allied health treatment – should proceed as normal, providers can seek retrospective financial approval when DVA re-opens. Defence Service Homes Insurance – help with policy and claim enquiries is available 24-hours a day on 1300 552 662. It is also important to note that the last pension payday of the calendar year has been brought forward to Monday, 22 December 2014 to allow payments to be received prior to the Christmas Day public holiday. All other pension pay dates will remain the same. The training program for 2015 has been finalised and details can be downloaded using the links above. The course information document outlines the content of individual courses and prerequisites. Refresher training for Welfare and MRCA will continue to utilise the on-line eLearning modules, allowing for this training to be completed at any time and at your own pace. Enhancement training courses in MRCA, SRCA, GARP and SoPs can also be taken using the on-line eLearning modules. Training is normally conducted at the DVA office in Adelaide or in regional locations as indicated on the Course Calendar. Additional training outside of the program may be conducted at other locations within the Adelaide area or a regional location, where time and presenter availability permits. This can be discussed with the TIP Chair, John Cadd 0418 842 228. Should a critical need for training exist and no appropriate course is available in the SA/NT program, it may be possible to facilitate attendance at a TIP course interstate. This would be assessed by the TIP Consultative Committee on a case by case basis. This can be discussed with the TIP Chair, John Cadd 0418 842 228. A nomination is required to attend all training courses (including eLearning courses). Completed nomination forms should be forwarded to the TIP Admin Support Officer. ‘The Orderly Room’ will continue to be our primary point of information for TIP SA/NT matters and we encourage you to visit this site on a regular basis. From here you can download TIP course information and forms, catch up on information relating to welfare, pensions and compensation, and view links to important websites. We look forward to seeing you at a training course in 2015. Thought I would put a few words on to the web to let you know what has been happening in the training arena for this year. The program was approved at the meeting of the TCG and advised to all those who have attended training in the past couple of years and also detailed on the web site (and if you are reading this you are on it now). We have conducted training not only at Blackburn House but also down at the TPI Assn, Colonel Light Gardens RSL, Port Lincoln and Darwin. We did not get to Mt Gambier or back to the Riverland. The total number of courses conducted was 11 and total trained 81. Regretfully there were a number of courses cancelled due to insufficient numbers but maybe next year we will see an influx in volunteers wanting to put themselves forward for Compensation/Pension or Welfare courses. TIP Training is currently conducted by a team of ESO personnel, being Dean Ryan, Jeff Yates, Tich Tyson, Alan Hook and myself, with of course Phil Boys doing all the work to ensure we get to the lectern with all the information we need. I would like to thank them for all their time and efforts in putting themselves out there in the service of the veteran community, whether they be ex-service, current serving or DVA staff. I would also like to than a couple of visiting lecturers who have supported us along the way. National Conference of TIP Chairs. · - Review of Welfare Training Packages. · - Review of Advocacy Training, being conducted by Bill Rolfe and his draft report should be available to the Ex Service Organisation Round Table meeting which is to be held in November 2014. · - Creating a single storage platform for TIP Courses. Other than that we continue to present to the ESOs a program of training that will help them in their endeavours to assist the veteran community. The above SoPs take effect from 17 November 2014. The focussed investigations below, related to "a threatening, hostile, hazardous and/or menacing situation and/or environment". The Authority declared that it did not propose to amend any of the Statements of Principles for the reason that there is either no new sound medical-scientific evidence available or insufficient sound medical-scientific evidence available to justify an amendment to any of these Statements of Principles. The Declarations to be notified will appear in the Government Notices Gazette of 4 November 2014. The Declaration and reasons for the decision for 'alcohol use disorder' are available below.
. The other Declarations below, combine the reasons for decision within the Declarations. The above Declarations and Investigation Notices will appear in the Government Notices Gazette of 4 November 2014. Group programs provide a safe and supportive environment in which to learn about issues impacting on mental health and wellbeing, obtain treatment and support for mental health concerns, connect with others with similar experiences and/or develop self-management skills to enhance wellbeing. Group programs are an important part of VVCS evidence-based treatment services. Whether they are veterans, partners or other eligible family members, group program participants often report that being in a group helps them understand that others may share their experiences. Others feel more comfortable learning in a group than in counselling. An important benefit of group program treatment is the chance to learn about and address mental health concerns in a supportive environment. All VVCS group programs are conducted by facilitators experienced in working with veterans and their families. The length of VVCS group programs varies from 2-day workshops to sessional programs run over a number of weeks. All group programs are provided free to eligible participants. This 2014-02 release is a major version and (only) the full CD is available to download. The above SoPs take effect from 22 September 2014. The Investigation Notice for this investigation will appear in the Government Notices Gazette of 19 September 2014. Current serving ADF members, including Reservists, who hold a purple ADF ID card will benefit from a new DVA and Defence move to reduce red tape in the claims application process, Minister for Veterans’ Affairs Senator the Hon Michael Ronaldson announced today. Senator Ronaldson said that from 1 September 2014, ADF members will be able use their purple ADF ID Card to prove their identity for the purposes of making a DVA claim. Senator Ronaldson said the new arrangement was made possible through DVA and Defence’s existing information sharing arrangement and would ensure current serving members and Reservists could get help quickly without the need for initial paperwork. “The ability for ADF members to talk to a DVA staff member at over 35 bases across the country as part of the On Base Advisory Service, or attend a DVA office in person and lodge a claim on the spot, will ensure they get faster access to the support they need. Senator Ronaldson said this arrangement is one of many actions the Government is taking to reduce red tape and the time taken to process claims. RSL State Headquarters will be holding a Welfare Information Networking Day on Tuesday 16 September at Torrens Parade Ground. All ESOs are welcome to extend this invitation to anyone involved in the care and welfare of the community. As part of the Abbott Government’s ongoing commitment to increasing the accessibility of veteran mental health support, Minister for Veterans’ Affairs, Senator the Hon Michael Ronaldson today launched an integrated social media presence for the Veterans and Veterans Families Counselling Service (VVCS). "The VVCS is at the frontline of mental health and wellbeing support for the veteran community and provides counselling and group programs for veterans and their family members," Senator Ronaldson said. Combined with the recently launched VVCS Website, a VVCS Facebook presence provides an additional pathway for members of the veteran community and their families to connect to this important support service. "The VVCS Facebook page will enable the veteran community to learn more about VVCS group programs and other services. It will also provide an avenue for community questions to be answered as an online VVCS veteran support community is established." Announcing the launch on Vietnam Veterans Day, Senator Ronaldson said that online tools can support existing services in an important way. "The VVCS online presence is part of a wider initiative by my Department to increase on-line and social media presence." The overwhelmingly positive response to the recent mental health support campaign sponsored by the DVAAus Facebook page has shown that there is a real desire to learn more about veteran mental health via online and social media channels. The VVCS provides free and confidential, nation-wide counselling and support for war and service-related mental health conditions, such as posttraumatic stress disorder, anxiety, depression, sleep disturbance and anger. The VVCS also provides relationship and family counselling to address issues that can arise due to the unique nature of military service. SRCA training is now available via the on-line training modules. The normal nomination process is to be used for those wishing to do this training. Once the nomination form has been received, login and password details will be advised. The Minister for Veterans’ Affairs, Senator the Hon. Michael Ronaldson has officially launched a new dedicated website for the Veterans and Veterans Families Counselling Service (VVCS) at the South Australian RSL Congress in Adelaide today. VVCS is a free and confidential service that offers eligible veterans counselling, group programs, and after-hours crisis support 24 hours a day. "Tackling the mental health challenges facing veterans and their families is a key pillar of the Government’s plan for veterans’ affairs. The Government’s priority is to ensure that we have in place the mental health services and supports that are needed for veterans and their families." "VVCS is at the frontline of mental health and wellbeing support for the Australian veteran and ex-service community. The services provided by VVCS are particularly important as they also support the families, who significantly support veterans." The launch of a new dedicated website for VVCS builds on the Minister’s recent announcements to improve access to mental health treatment, including access to counselling and support. From 1 July 2014, former serving members who have border protection service, served in a disaster zone either in Australia or overseas, served as a submariner, were involved in training accidents resulting in serious injury or were medically discharged can access VVCS services. VVCS services are also available to partners and their dependent children, up to the age of 26, of these newly eligible service men and women. Along with the partners, dependent children, aged up to 26, and parents of members killed in service-related incidents. "The Government spends around $166 million a year on meeting the mental health needs of Veterans and their families. The funding for treatment is demand driven, and it is not capped - if treatment is needed, it is funded." "This Government is determined not to repeat the mistakes of the past. This means we need to develop a strong understanding of the issues and challenges faced by veteran and defence communities including their families, and to have a robust evidence base to inform efforts to reduce stigma around mental illness and to keep improving our services." Senator Ronaldson said. A mobile version of the new VVCS website has also been developed to ensure that veterans and their families can access information and support details when they need to. Today the Minister for Veterans’ Affairs, Senator the Hon Michael Ronaldson, announced three major initiatives which expand existing mental health services for veterans and their families. From today, eligible veterans will have access to treatment for alcohol and substance use disorders and be able to access treatment for certain conditions without the need to make a claim for compensation from the Australian Government. Counselling services will also be expanded to more veterans and family members. "Tackling the mental health challenges facing veterans and their families is a key pillar of the Government’s plan for Veterans’ Affairs. The funding for treatment is demand driven, and it is not capped." Senator Ronaldson said. Firstly, there will be greater access to DVA’s payment for mental health treatment, whether or not the mental health condition is related to service. Currently, these arrangements cover diagnosed posttraumatic stress disorder, anxiety, and depression. DVA will now also pay for treatment for diagnosed alcohol and substance use disorders, and an increased number of individuals with peacetime service only will also become eligible. Secondly, the Government has broadened the accessibility of counselling and support services provided by the Veterans and Veterans Families Counselling Service (VVCS) with an expansion to client eligibility. In addition to those already eligible for support, current and former serving members who have border protection service, served in a disaster zone either in Australia or overseas, served as a submariner, were involved in training accidents resulting in serious injury or were medically discharged are now eligible for VVCS. Access to VVCS services are also available to partners and their dependent children, up to the age of 26, of these newly eligible service men and women. Additionally, the partners, dependent children aged up to 26, and parents of members killed in service-related incidents are eligible for VVCS support. Finally, in an effort to promote early intervention and prevention, all former serving personnel are now able to access a comprehensive health assessment from their GP. A Medicare rebate is available for this health assessment. "This comprehensive health assessment will help your GP to diagnose and identify early any mental or physical health conditions you may be experiencing. Your GP will then be able to treat you or refer you to other services," said Senator Ronaldson. Over the next four years, the Department of Veterans’ Affairs will spend more than four times the amount on mental health than it will on commemorating the Anzac Centenary. That is $145 million on the Centenary programme for 2014-2018, compared with the more than an estimated $664 million to be spent on mental health services over this same period. "With over 72,500 men and women having served this nation oversees since 1999, we must ensure that this nation does not repeat the mistakes it made post Vietnam." If you identify a member of the veteran and ex-serving community who you think may benefit from VVCS services, please encourage them to call 1800 011 046 to discuss their eligibility and support options. The above SoPs take effect from 2 July 2014. These Amendment SoPs concerning myeloma have effect from 13 May 2014 and are made in accordance with the direction of the Specialist Medical Review Council, Declaration No. 23. The Investigation Notices for these investigations appeared in the Government Notices Gazette of 1 July 2014. New cards will be distributed to all current card holders during the month of June 2014. Applications for Round 16 of the Building Excellence in Support and Training (BEST) Grants program opened on Monday 26 May 2014 and close on Monday 23 June 2014. The At Ease website helps veterans and their families to recognise the signs of poor mental health, access self-help advice and tools, learn when and where to find professional support and learn from the stories of other veterans. With more than 50% of visitors accessing the At Ease portal via a mobile site, DVA has developed this mobile version to deliver quick information to people on the go. These SoPs revoke the SoPs previously determined for this condition. The above SoPs take effect from 14 May 2014. The reasons for decision for malignant neoplasm of the prostate are available here. The reasons for decision for chronic multisymptom illness are available here. The Repatriation Medical Authority declared that its does not propose to amend the contents of the current SoP concerning 'non-Hodgkin's lymphoma'. The Authority concluded that the sound medical-scientific evidence available is not sufficient to justify an amendment to this SoP. The Declaration will appear in the Government Notices Gazette of 7 May 2014 and can be viewed here. The above SoPs take effect from 7 May 2014. The following SoPs will take effect from 14 May 2014. The SoPs, and reasons for decision, will be available from that date. It is planned to conduct the Tribunal Advocacy Course (TAC) in early July 2014. Nominations close 30 May 2014. Planning of the TAC Refresher course requires the details of Level 4 Advocates who want to attend. The basis of where the refresher course would be conducted, to attain the best economical use of funding, the course would be held in the state where most of the nominees come from and others would be transported and accommodated in the chosen state. The decision is in accordance with the Direction of the Specialist Medical Review Council and has effect from 19 December 2013. This decision amends SoP No. 5/2008 concerning posttraumatic stress disorder. 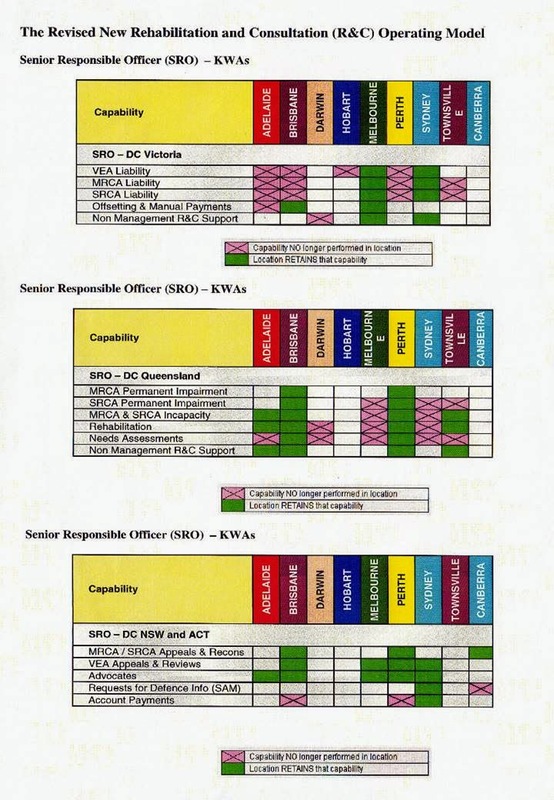 All of the above SoPs take effect from 15 January 2014.